HP recommends this configuration for virtualized medium-sized solutions where high-availability is a requirement, and the expected user population is up to 500 users (assuming an active user concurrency of typically 25-50%). The expected solution workload is mostly collaboration and portal activity, with some use of team sites and My Sites. SharePoint 2010 has extended the possible topologies for the Search service by enabling more than one Index Search service to be run on separate servers. This feature can be used to provide redundancy for the service (high availability), or to divide the crawl sources across multiple services, thus improving overall crawl speed, and to apply differing crawl rules and frequencies to better match the business need regarding freshness of specific index data. For approximately 500 users and above, the environment will need to be divided up into four physical servers, two running Hyper-V R2 VMs in a cluster, and two dedicated to a physical SQL Server failover cluster. In this example, two HP ProLiant DL580 G7 servers, each configured with four 8-core processors and 64GBs of RAM, will support the Web Front End/Query and Index services in an active/active failover cluster. This cluster will use a shared HP P2000 G3 MSA LFF array to provide a single Cluster Shared Volume for all the VHD (virtual hard disk) file containers. In this example the WFE and Query services are supported on two child partitions, which are configured to have four virtual CPUs (vCPUs), and 8GBs of RAM each. The Index Search service runs on two further child partitions, along with the Central Administration and other application services. SQL Server is installed on a non-virtualized failover cluster consisting of two HP ProLiant DL580 G7 servers with four 8-core processors, configured with 64GBs of RAM each, eight internal SAS disk drives, and an HP P2000 G3 MSA SFF array. Two “Hot” RAID0+1 volumes of eight disks each and a single “Cold” RAID5 volume of eight disks are created to support SQL Server. HP recommends this 2-server solution for SMB customers who are looking to deploy solutions in a virtualized environment using Microsoft Hyper-V R2, and also wish to employ high-availability technologies to ensure continuity of service. The expected user population is up to 150 users (assuming an active user concurrency of typically 30-50%). It uses the same SharePoint service deployment topology as the “Medium-sized configuration (3-server solution)” physical server solution, but deploys the three roles onto three virtual machines (VMs) rather than three physical servers. 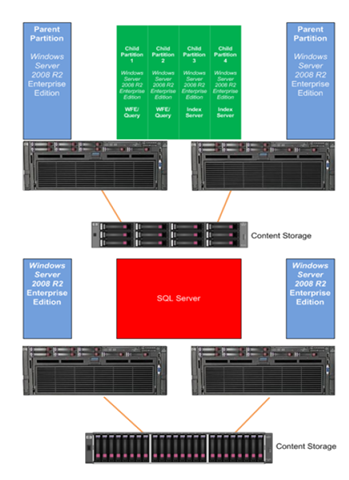 The two servers are formed into an active/active failover cluster and then run Hyper-V R2 to virtualize the environment. The three roles are then deployed onto three VMs across the cluster, each VM being configured with 4 virtual CPUs (cores) and appropriate memory. The total server memory has been sized to support the VMs and any Hypervisor and OS overhead. Nominally the SharePoint WFE and Query Search roles would run on Server “A”; and the Index Search and SQL roles on Server “B”. However should a server fail for some reason, the solution has been sized such that the remaining active server can support the full required load and role VMs will automatically fail-over to the running server. 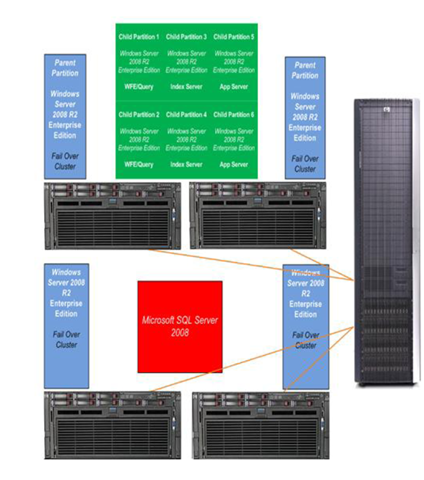 Storage utilizes an HP P2000 G3 MSA to provide the required SAN technology to support the failover cluster. An AMD-based solution is shown. Solutions and systems that address High Availability (HA) and Disaster Recovery (DR) have been paramount in preventing application downtime and its crippling effect on productivity and operational output. But the traditional differences between HA and DR have been blurred by new mechanisms introduced by emerging technologies. And while it is possible to provide HA and DR together, there are cases when it is important to keep the two activities separate in order to guarantee 24X7 access to business applications. In The Shortcut Guide to Untangling the Difference Between High Availability and Disaster Recovery, author and IT expert Richard Siddaway examines HA and DR, and explains how understanding the many differences between the two will allow you to create a proper system to guard against application downtime. Siddaway offers his insight not only on how technology can be used in HA and DR solutions, but also how management of the human element must factor into any successful HA / DR solution.